Hello everybody! I am writing this to introduce myself. 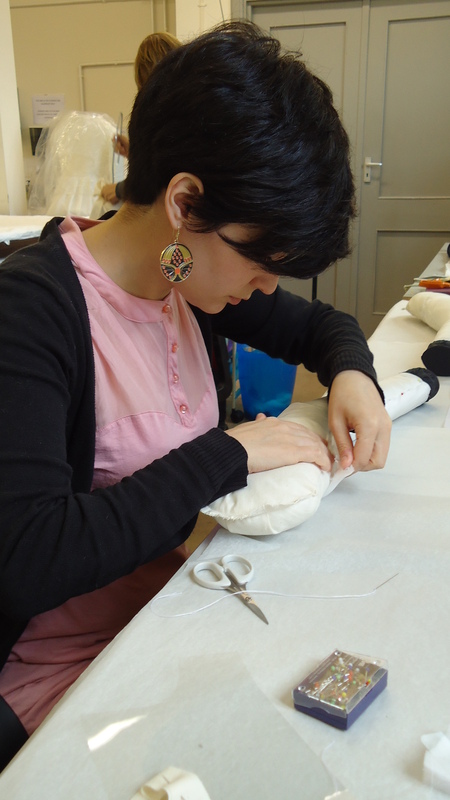 I am Maria Pardos, one of the new ICON textile conservation interns. Previously I have studied painting and textile conservation & restoration in Spain, where I come from, and most recently a Masters Degree in Heritage State of Conservation Diagnosis. I have worked with many materials, although in last few years I have focused on textile conservation, where I feel more comfortable working. This has been an amazing first two weeks for me and Emily. We’ve been mounting costumes for an exhibition entitled ‘Women Fashion Power’ at The Design Museum in London, and installing the next exhibition ‘Birds of Paradise: Plumes & Feathers in Fashion’ at The Bowes Museum. It looks great, you shouldn’t miss it! Hi, my name is Emily and I am also an ICON textile conservation intern. I originally studied costume design at Edinburgh College of Art, but then went on to study Textile Conservation at postgraduate level at the University of Glasgow, graduating this summer. I have a particular interest in costume so working at The Bowes Museum is a fantastic opportunity to work with objects from the fashion collection. In fact during my first week here, I was lucky enough to help install the current ‘Birds of Paradise’ contemporary and historical fashion exhibition. You can read about the installation of the exhibition here. Last week, I did my first courier trip, accompanying Katy, the Museum Textile Conservator, to the Design Museum in London to help install ten pieces of costume for an upcoming exhibition. So far it has been a great introduction to the Museum and I’m very much looking forward to working on many more interesting objects over the next year! Hello my name is Paul Turner and I am the new Icon Paintings Conservation intern. The internship will last for 1 year and will encompass working on paintings from The Bowes Museum’s collection alongside the Senior Painting Conservator, Jon Old. To give you a bit about my background, I have recently completed an MA at Northumbria University in the Conservation of Fine Art [Easel paintings], in addition to a number of short painting conservation placements. I also previously studied Fine Art (BA) at Newcastle University, and worked as an Art Handler for two years for the auction house Christies in London.